A frightening natural phenomenon has finally been captured! For the first time a stable Fire Tornado is built of this size (16m high flame) and is capable to run at various weather conditions (wind & rain). Theres no GLOW without fire. Fire is the mother of light; nature in all its destructive beauty. Artist and technical engineer Ivo Schoofs saw what happened when a tornado raged across a forest fire to elevate the flames. He wondered if it was possible to reproduce that very same effect. 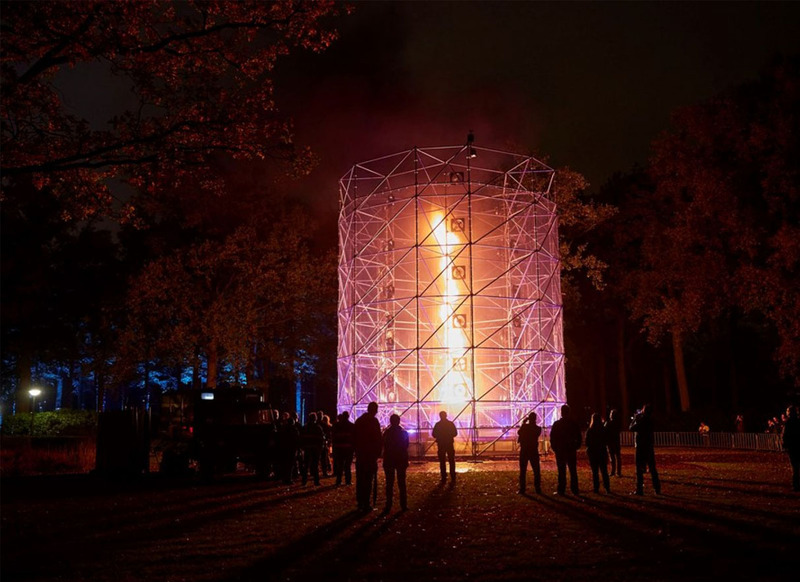 After a successful scale-model of a fire tornado, Ivo Schoofs and his team have now successfully built a fascinating light installation which spectacularly exposes a piece of Natures Architecture. The Large Fire Tornado is created by a powerful fire source and 36 industrial fans inside aÂ hexagonal scaffold of 12m height. You are about to see light in its most original form. You are about to see light in its most original form. Ivo Schoofs has been a guest of GLOW before. Since then his Large Pendulum Wave installation has successfully travelled to many prominent festivals across the globe.